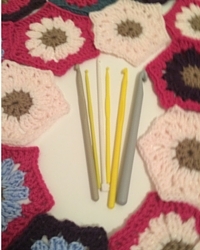 In this article we are going to help you put together the perfect crochet kit. 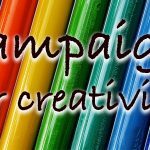 Whether you are completely new to crochet, or well established in the hobby, I will be giving advice to help you decide which crochet equipment to invest in. 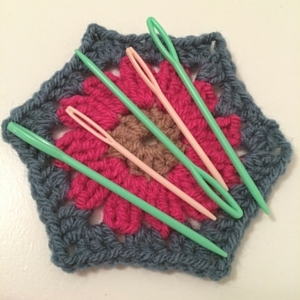 Making sure that you have a successful crochet session every time you pick up your hook and yarn. From the basic beginners tools needed for a crochet starter kit, to those crochet essentials, and other crochet accessories and crochet supplies that will keep your hooking flowing smoothly and looking fantastic. The best way to begin your crochet journey is with a great crochet starter kit. How you put this starter kit together is entirely up to you, but my recommendation if you have never crocheted before is to have a crack at it with a very basic crochet starter kit before you tool up with everything under the sun. There are some amazing deals on Amazon for sets of crochet hooks. Whilst you may think that buying an individual hook would be a more cost effective way of getting started, actually the best value for money is in the cheap but effective sets. My first set of crochet hooks was a multi-sized multi-coloured set of aluminium crochet hooks like this one for under a fiver. If you know which crochet pattern you want to have a go with, then careful check the notes to make sure you are ordering an appropriate weight and type of yarn. The most common yarn for beginner crochet patterns is DK yarn. If you haven’t set on a pattern yet but want to get your kit ordered, then pick a couple of different colours of this weight and you won’t find it too hard to get a pattern to suit. You can find out more about the different weights of yarn described in crochet patterns here. You can also check out some advice on great crochet channels with clear beginners tutorials in my learning to crochet article. Any sewing in off loose ends can be done at first using your hook, which will also help you to get to grips with holding it and finer manipulations of the hand. Any cutting can be done well enough with some kitchen scissors or a vegetable knife at this stage too. Just make sure that they are fairly sharp, to avoid fraying your threads. 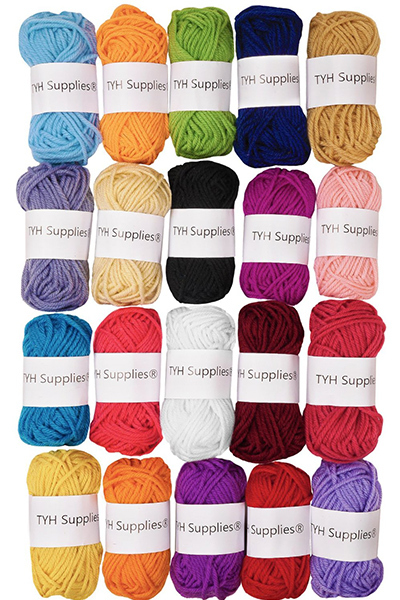 So, yarn and a hook are the only things you need in a beginners crochet starter kit in order to kick off your inevitable crochet addiction. 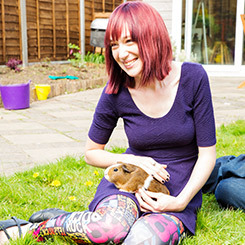 Let’s move on now to those crochet essentials for getting your hobby established. 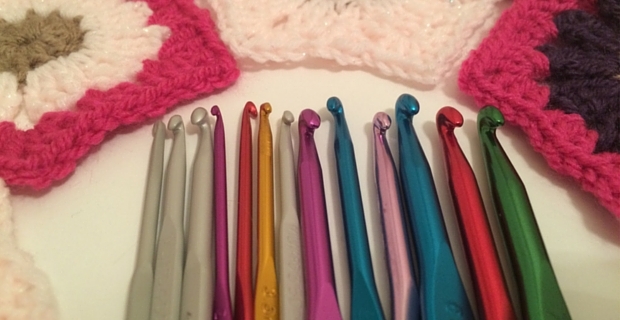 Your crochet starter kit contains the bare bones of what you will need to get crocheting. Once you have started though, you will soon find that there are some pieces of crochet equipment that you wouldn’t want to do without. I think of these as my crochet kit essentials, and we will take a look at each in turn. Crochet hooks are not as straight forward as I had assumed when I began crocheting. They come in a variety of materials, sizes and, for lack of a better word, ‘hookyness’. 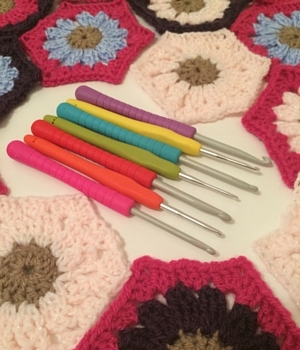 If you want to crochet a range of different items, you will need a range of crochet hooks to suit each of these purposes. A range of sizes of aluminium crochet hook is the first thing I point new crocheters in the direction of when prepping their crochet kit. They are great all purpose tools. The hook end is fairly slim and pointed and so can grab and pick up threads of yarn easily, they are clearly marked and distinguishable from each other and they have a flattend grip to help you easily move them around. 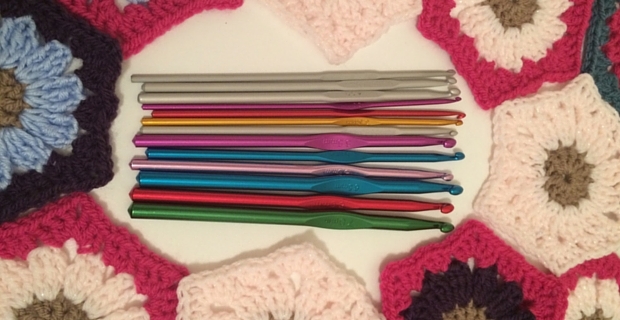 I have a couple of sets of aluminium crochet hooks, because they are so useful and I often have more than one project on the go at the same time. I like to leave a hook in the crochet I have temporarily paused work on, because it’s easier to pick it up again if it’s convenient. Not to mention the pain of working out which hook size you were using if you don’t. These range in size between 2mm and 8mm, and are often all different colours to help you quickly see which you require. If you enjoy working on intricate lacework and tiny toys, then steel crochet hooks are the only tiny hooks I use. They come to very fine points, and can be incredibly small sizes. I haven’t as yet done a lot of fine lace crocheting, although I certainly intend to at some point. So I mainly use these very small hooks for tiny toys and details on larger crochet pieces. I have a couple of very good quality steel crochet hooks which turn stitches very well, which were kindly given to me by a friend whose grandmother had passed them on to her. I also have a set which came in a pack, along with some more of those ever useful aluminium crochet hooks. I believe it is this exact set of steel crochet hooks and aluminium crochet hooks on Amazon. My soft grip crochet hooks are some of my favourite members of my crochet kit. These have aluminium or plastic hook ends, but a padded shaft which is easy to hold and move. 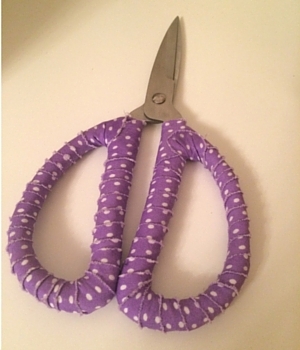 The benefit of these hooks is that when you are doing repetitive stitching, or working a very tough material like I did with my twine basket crochet pattern, they prevent you picking up blisters and keep the wrist and finger aches down really well. There are a couple of potential downsides to them however, that need to be considered when you pick which ones to buy. One being that the hook ends are short, because a look of the length of the hook is taken up with the grip. Whilst not normally a problem, I have made some patterns where I have needed to switch as they can’t hold enough loops comfortably to work when for example treble crocheting stitches together. The other is that the numbers on some of my soft grip hooks have rubbed off! One brand have them carved or moulded into the grip itself, so this hasn’t occured. However, the ribbed variety you can see pictured here had the numbers inked on. This is a shame beacuse they have a longer hook section which is a little easier to use. So I recommend when you choose your soft grip hooks to go for those with a longer hook section and numbers engraved into them rather than inked on. Those grips are designed to rub into your skin, and you don’t want to take the numbers with you as you work. Plastic crochet hooks also have an important place in my crochet kit. They have a different feel to the metal hooks, and are often blunter. I find that they work well with heavier weight yarn, and that they slide nicely in your grip for larger stitches. They are also cheap, light weight and come in a wide range of sizes. My only 9mm crochet hook is a plastic one, and it is very nicely weighted and workable. I also have some fab slightly smaller plastic crochet hooks in a bright yellow color. The only downside of these smaller plastic crochet hooks is that they can be a little fiddly to work with as they have very small shafts. I highly recommend getting at least one pair of very sharp scissors for your crocheting. Although using the household scissors works fine on a temporary basis, in the long run if you are anything like me it will annoy you. Someone will move them, use them for something mucky, blunten them or want to share them whilst you are busy. My favourite scissors for crocheting are the ones pictured. A part of my Christmas present from my sister, they are razor sharp, pointed to the end and have soft wide handles. Easy to pick up, cut and put down quickly. It’s worth mentioning that as well as these scissors, I almost always have a knife nearby when I crochet as well. Whilst scissors are almost always the easiest tool to cut thread, if you are working in a fiddly place or separting strands having a knife to fit into the gap can be more accurate. Very sharp scissosr, with fairly fine blade width and large comfy grip are crochet essentials. The knife is optional, but advised. It perhaps goes without saying, that whilst very sharp scissors and knives are the best way to cut yarn, they aren’t exactly family friendly. You have two options for dealing with this. One is to have blunt ended scissors for daytime use. These are less dangerous, although they still have potential to cut a kids finger. They are also far harder to work with. My solution is to simply keep my scissors and knife high up and out of my daughters reach. If they aren’t currently cutting, they are far from grabbing hands. Whilst a bit of pain, with kids safety comes first. Plus the extra getting up and down is probably keeping me ever so slightly fitter! Crochet needles (often referred to as yarn needles) are crochet essentials. Although you can hook in your loose ends, this case take a dreadfully long time and be far less neat and tidy than using a needle. I have two types of crochet needles in my crochet kit. Steel yarn needles and plastic yarn needles. These give me three different sizes to work with. Plastic yarn needles are great for blankets, throws, covers. Anything with a looser weave of stitch. They are also vastly cheaper than steel yarn needles, so you can have loads kicking around for convenience of use. I have two sizes of plastic yarn needle. For lighter weight yarns I use the smaller size, and for heavier weight yarns I use the larger. I use my steel yarn needles for sewing in to small stitches of less than 4mm, usually within toys. I also use them for sewing in the ends on tougher constructions, like crochet baskets. Because they are made up of two strands of yarn, the stitches are tighter and less easy to work back into. Steel yarn needles are both fine and strong, and can slip through those fiddly little gaps. Crochet stitch markers are a bit of a life saver when it comes to keeping your crochet project on track. Which is why I have an entire article dedicated to using and choosing the right ones for you. You need crochet stitch markers whenever you are working in a continuous spiral, or with a pattern that repeats and changes at specific points. They allow you to keep count of how many stitches you have made, and which instruction in the crochet pattern you should be following at that point. You can buy very cheap crochet stitch markers, but I have had poor results with the cheapest around. I find that have very small openings and snap when you try and expand them to push them through the stitch. I have two different styles of stitch marker, and they are useful for varying crochet projects. There is the split ring variety and the nappy pin variety. 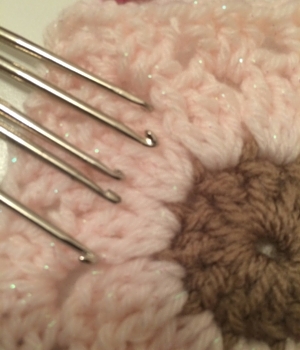 I would advise having a pack of both types of crochet stitch marker in your crochet kit, as they have different pros and cons depending upon your current crocheting needs. 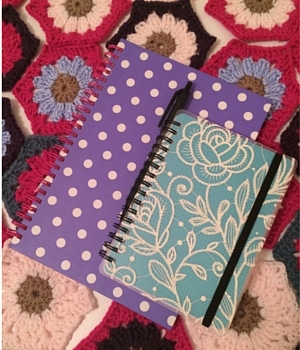 My crochet notepad is almost as important to me as my hooks when I am crocheting. If I am honest, I probably have about seven notepads on the go at any one time, dotted around my house wherever I was last putting hook to yarn. Mine are predominantly used for writing down my patterns as I create them, keeping count of rows and drawing out potential new patterns and ideas. I also like to note which hook I am working with for a particular pattern, and the batch number of the yarn I am using if I will require more than one skein. The other big use my notepads are put to is with tally charts. They are a great way of keeping track of your rows and stitches. 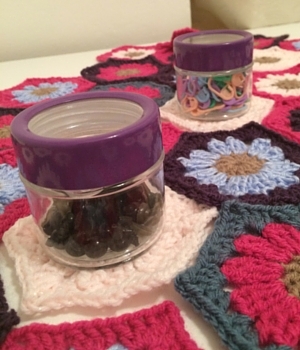 How you choose to store your crochet kit will depend upon a few factors. How much equipment you have, where you do your crocheting, and even who else lives in your house. 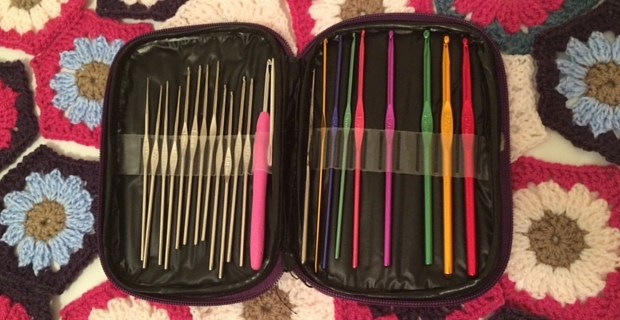 Sets of crochet hooks sometimes come presented in a crochet hook case. This will have the exact number of spaces required for the hooks that it arrived with. 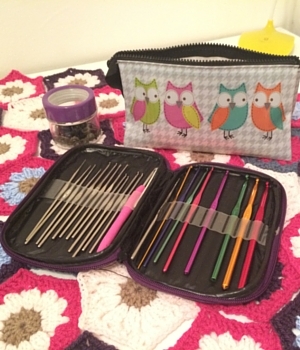 Cheaper aluminium packs of crochet hooks will often be in a disposable plastic case, but some of the more complete sets such as my steel and aluminium crochet set pictured here come with a case you can keep and use yourself. This is helpful for storing these crochet hooks, but not ideal if you have a vast quanitity. 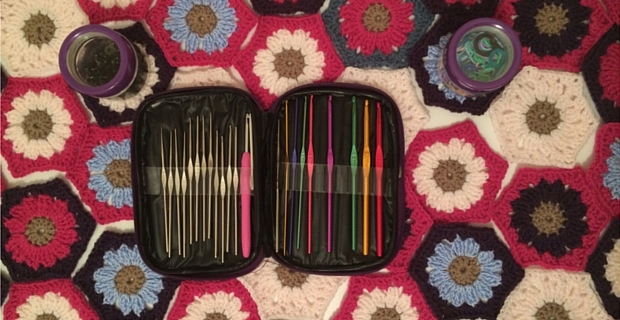 I actually store the majority of my crochet hooks in a pencil case. It took a while to find one which suited my purpose, but this was ideal. It has two sides divided by an additional zipped pocket in the middle. I fill this pocket with my yarn needles, and use the divide to seperate types of hooks. 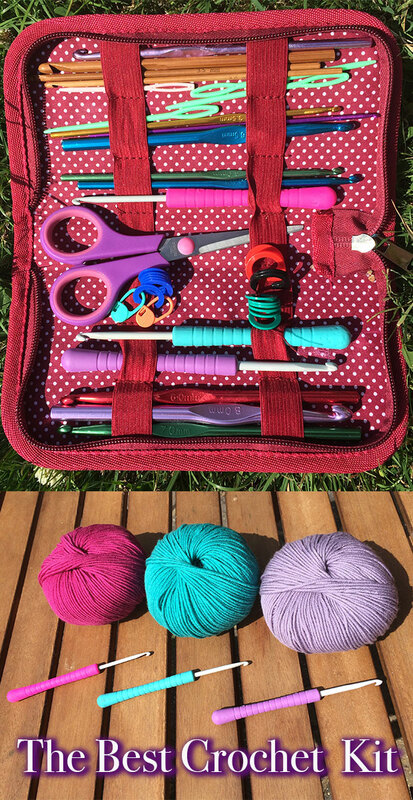 A pencil case is light, portable and if it has dividers can even keep your crochet hooks in some sort of order as well! I keep my little crochet accessories in tiny pots with screw tops. This keeps them safely in one place, and discourages my young daughter from playing with the contents! General crochet accessories are fun things. They don’t have to be essential to your crocheting, but they can help the crochet session to run smoother, or simply be fun to own! Here are a few crochet supplies which might be worth checking out when you do your crochet shop. If you are interested in making granny square blankets, then you can buy special blocking boards for helping you with this. Personally I have never used one, but find that a cork board and pins come in very handy for the same purpose. 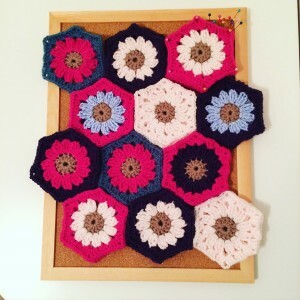 When you create dozens of squares or hexagons using the granny stitch, you will find it much easier to attach them together and end up with an even and flat pattern if you first block them in. This involves pinning the squares into their final desired shape and leaving them in place for a few days for the material to settle. I recently made up a granny square blanket in this manner using a hexagonal pattern. Sadly I didn’t take a picture of their slightly questionable shapes beforehand, but the pretty pattern you can see on my blocking board would not have turned out so well if I hadn’t placed them like this. For a relatively small outlay you can get a large corkboard and a big pack of pins. It doesn’t need to be huge as you can stack the squares to the top of each pin’s height when you place them down. A tip regarding making sure the sizes are exactly the same is to cut out a paper shape with the measurements of one finished hexagon and lay this on the board, setting a pin at each corner. You can then stretch your granny hexagon over the pins and get the required finished shape. I have mentioned above that I use a notepad to count my rows, and indeed on complicated patterns even my stitches as I progress. But you can use a clicker to do this instead. You simply depress the button each time you finish a row and it gives you a count up, ensuring that you keep track of the rows as you work. 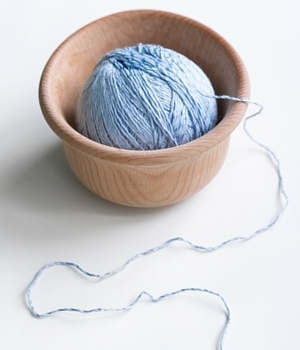 A yarn bowl is a great way of keeping the yarn you are working on safe and freely running. This can either be a regular high sided bowl, or one with a special gap for the yarn to run through. The former are easier to come by, the latter keeps the yarn more secure as you work. You can get some lovely stylish yarn bowls to go with your crochet kit, and it’s certainly something on my wishlist, if only because I think they would look pretty in my office! There are two main ways to add eyes to your crochet toys. One is to sew them on with thread or yarn, the other is to buy some pre manufactured eyes. These eyes can either be in button form, or as safety eyes. Sewing your eyes onto your crochet toy enables you to taylor them to suit the toy’s character, and indeed to give him the character you want him to have. Button eyes can be very stricking, are easy to attach and there is a huge range to choose from. The downside of buttons for eyes is that they can’t be played with by young children, as they present a choke hazard. That’s where safety eyes come in. They have a special backing plate, which screws on to the back of the visible rounded eye part. The back plate is considerably wider than the front and the space in your stitches, which gives the eye added security even when tugged at. They are relatively inexpensive and come in a large pack, so you can keep them handy for those spur of the moment creations. 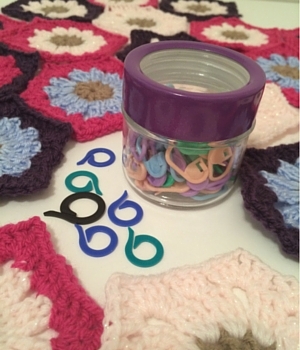 Putting together your crochet kit should be fun, as well as helping you to have a successful crochet session. If I have missed anything from your crochet kit in this list, why not share your ideas in the comments section below?